The world's first science education centre located within a working research laboratory has opened in Whitechapel, east London. 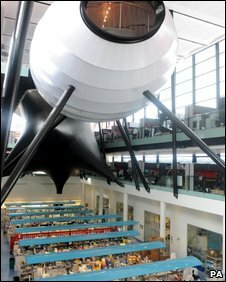 Based at Queen Mary University, the Centre of the Cell is a giant pod suspended above the laboratory. Children aged nine to 16 will be able to quiz researchers about their work and learn from interactive games. Centre director Professor Fran Balkwill said she hoped it would inspire young people to take an interest in science. Blue Peter presenter Helen Skelton opened the centre, which expects to attract around 40,000 visitors per year. All its educational content is based upon medical research conducted at Barts and the London School of Medicine and Dentistry. Free 90-minute school tours of the centre also cover topics linked to National Curriculum targets in Science. Professor Balkwill said the centre offered a "unique way" for children to engage with science. "There's a lot to learn about science here and children will learn in a way that's meaningful and fun," she said. "The aim of the centre is to inspire young people to take an interest in science, to improve their knowledge of science and perhaps to lead them to becoming scientists themselves one day."